As you can see in the pics the RDTS RECEIVER BOX part has the reinforcing rails cast in to the part. The cast in rails gives you advantages the 30 year old sheet metal never could. We've been pounding these belt feds for quite a while and thought it wouldn't make sense to duplicate the deficiencies of the old sheet metal given today's technology. Now please understand that we too are HK enthusiasts and made sure the outward appearance is ALL HK and all the advancements are under the hood!! The factory sheet metal reinforcing consists of nothing more than a portion of the separate reinforcing rail made without the top profile so it will slip under the sheet metal. Now the factory used high temp brazing or some method to duplicate a real nice weld between the piece under the sheet metal and the receiver...if you have a parts set you'll notice this in what's left of the receiver rail area and receiver. Keep in mind that this reinforcing piece has no physical attachment to the sheet metal receiver box area at all except where it is welded at the very rear area which is approximately only 1/2 of an inch vertically. For those of you who are using factory sheet metal keep in mind if you simply weld half rails to the weapon receiver to the rear of your sheet metal you have no reinforcing where you need it most...under the sheet metal. The reason the factory beefs up this area is readily apparent when you get an out of battery round and bow out your receiver just back of the trunion. We have repaired even factory type 21's that this has happened to...you can only imagine the damage with no reinforcing. Enough said!! We don't want to paranoid you just inform you so you can have a HK21 worth shooting for a long time. Also you might notice you'll have to have the semi auto style ledge welded on to use semi groups or registered full-auto groups and sears. PERFECT ALIGNMENT OF THE RDTS RECEIVER BOX IS ACHIEVED IN ALL AXIS. First the forward part of the integral rails are designed to position against the trunion area that's exposed on the weapons receiver, this puts the parts that will be slid into the RDTS receiver box area like the bullets guide and feed tray in perfect alignment and up against the trunion feed ramp. Secondly the movement side to side as viewed from the rear of the receiver is eliminated and the guess work of positioning it correctly. This is important because the bolt carrier bottom is barely scraping the flat base of the bullet guide to facilitate stripping the round from the link. 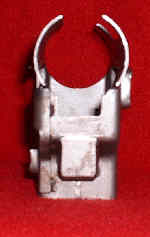 The trigger group ledge is already installed on the rear. No need to weld one on and hope it is position right so your sear release lever will have proper timing. The RDTS RECEIVER BOX is already machined for minimal custom fitting. The factory sheet metal is far from being ready to accept any of its parts. The feed box locking pin holes are undersized and the sheet metal lips on both left and right sides have none of the cuts and relief's needed to accept to feed tray. Without another HK21 to reference to you'll have many hours of fitting in store. We have also reinforced the rear of the left side of the RDTS RECEIVER BOX. On the factory sheet metal there is an additional cast part welded in to attach the lower portion to the radiused upper sheet metal. Look at the photos and you'll see what we are talking about!